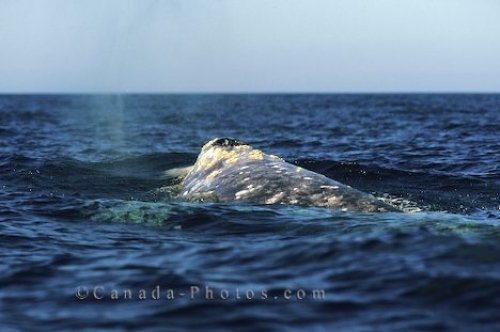 A Gray Whale surfaces in the warm waters around Baja, California in the United States of America. The backside of this Gray Whale in Baja, California is covered with barnacles as they attach themselves for a free ride. No known harm comes to the Gray Whale from these barnacles and when whale watching in Baja, California you can see for yourself that they seem harmless riding on the whale's back. Picture of the backside of a Gray Whale in Baja, California in the United States.